God owns it all! When will we realize this? 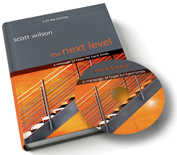 Today (Sunday, May 9), we start reading through “The Next Level” by Scott Wilson. This book has 31 short, but powerful readings that will give you God’s perspective about your tests. Each day over the next 31 days, I intend to post my thoughts on the daily reading. If you haven’t picked up a book yet, call the church (615-826-6222) and you can figure out a time to purchase one at the office before Wednesday’s service. The concept of personal ownership for the average person is a fairly new concept in human history. Ownership was only for the elite few for most of humanity’s history. We are blessed in western culture to own much of our lives (home, property, vehicles, intellectual properties). The problem with this as Christians is we forget that God still owns it all. Sometimes I feel like Scott’s little brother in McDonald’s (I loved this story on p. 23-24). I am holding onto my sole french fry, not remembering that God has the power to buy me as many bag of fries or none at all for the rest of my life. It really is about perspective. I must live as He is God, and I am not.